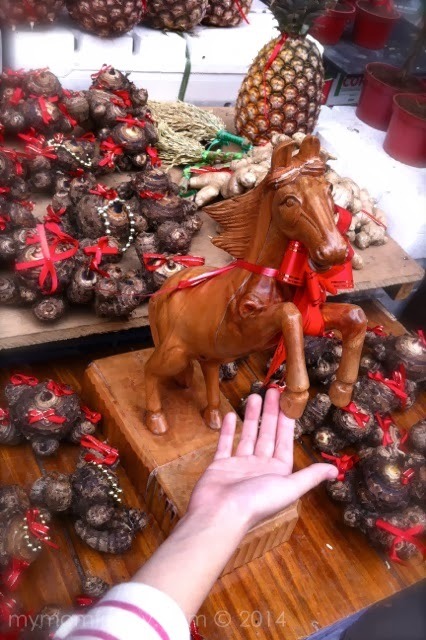 We are now in the year of the Wooden Horse. 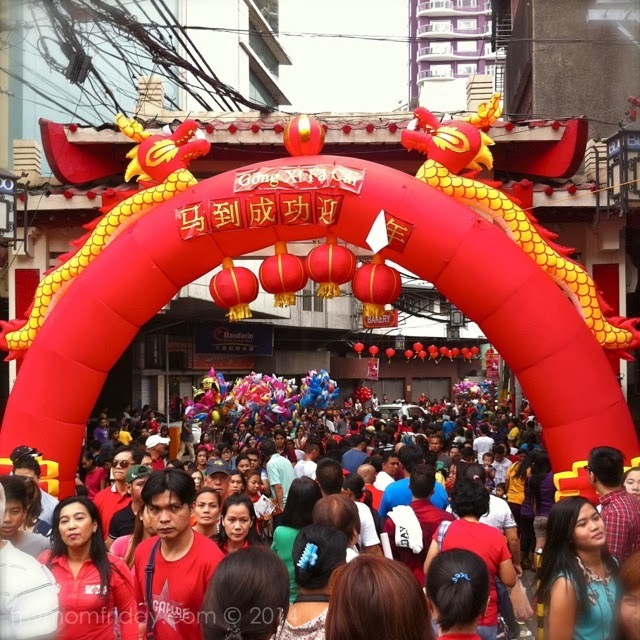 Chinese new year fell on January 31, 2014 and my family decided to troop to Binondo and join the festivities in Chinatown. 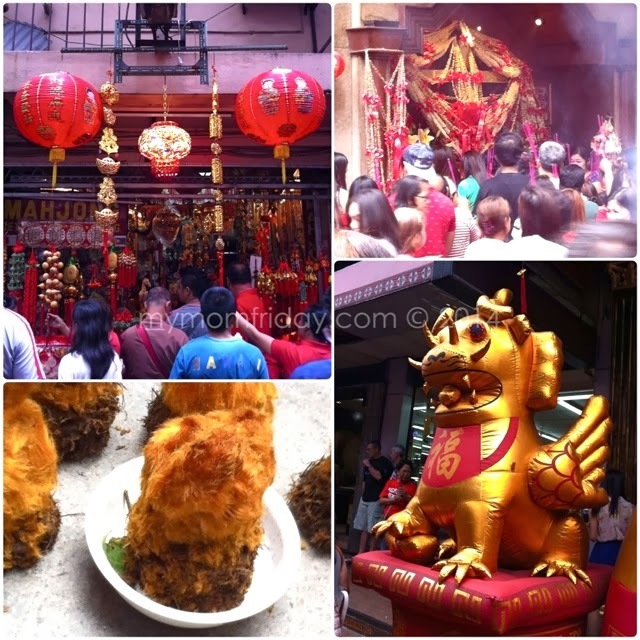 The first time we went there to celebrate was last 2012 CNY, which I also featured here. And let me tell you again, for those who do not know, we have the oldest Chinatown in the world, established in 1594. 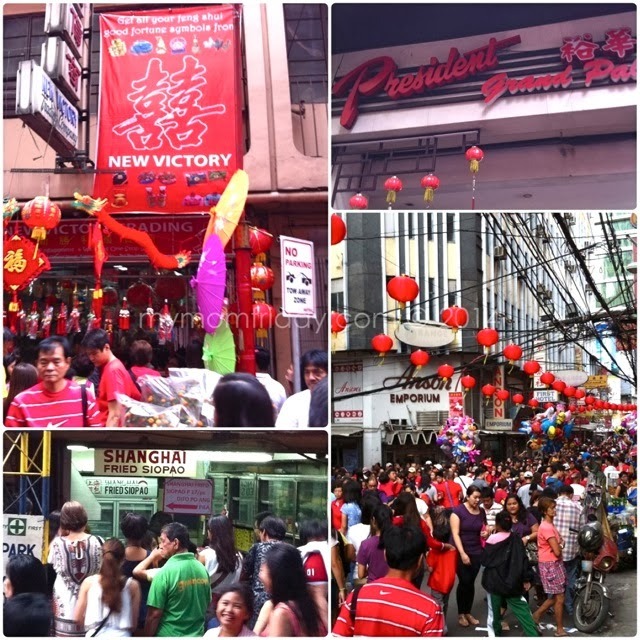 Binondo, Manila is most alive this time of the year as the event attracts people from all walks of life, even tourists. I enlarged all the picture collages below to let you enjoy what we've seen and experienced, the second time around. Many similar sights and sounds, and some pretty unique sightings as well. We really felt the energy and positive vibes just being there among the revelers. I don't know what that fan-like fruit/plant is below, left - leave me a comment if you have info. 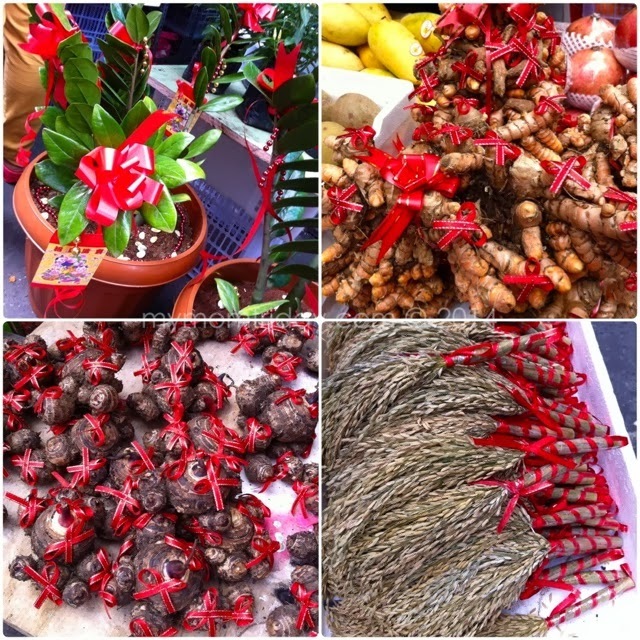 Money tree, ginger, taro, and even a bunch of grains were being peddled as lucky objects. 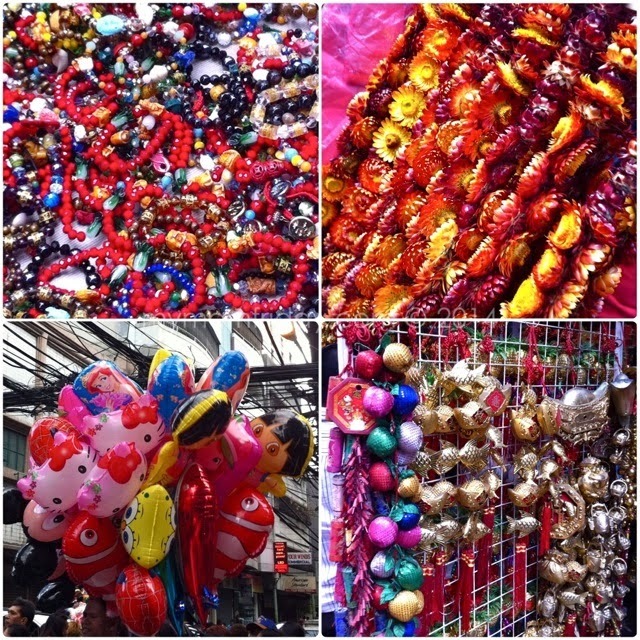 Bead accessories and everlasting leis are always present, as well as character balloons, and decorative "lucky" charms. 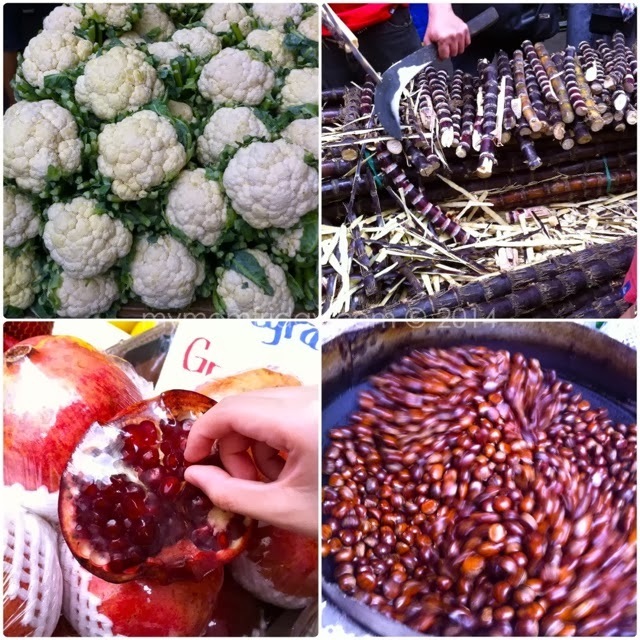 Look at these beautiful heads of cauliflower... and fresh juicy sugar cane. 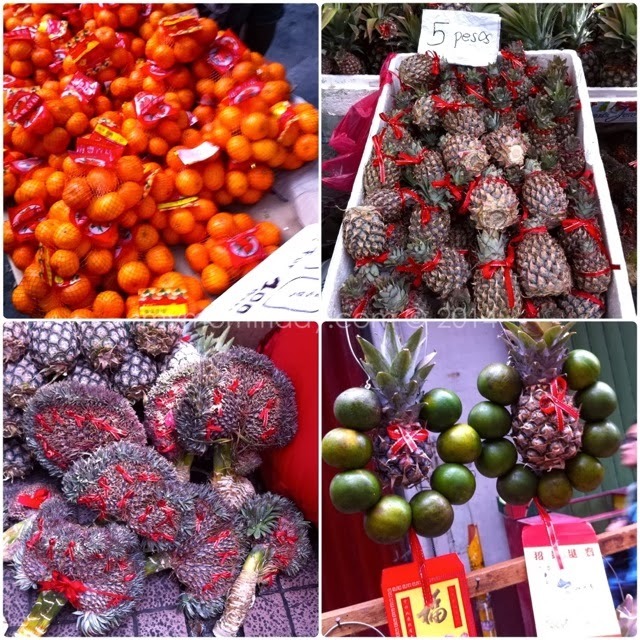 Some familiar establishments in the heart of Chinatown, institutions in their own right. We had late lunch here at the ever reliable President restaurant. The human traffic swelled as the hours passed from morning to late afternoon. People just kept coming. The first time we went two years ago, the kids brought home pets - baby quails and duckling. 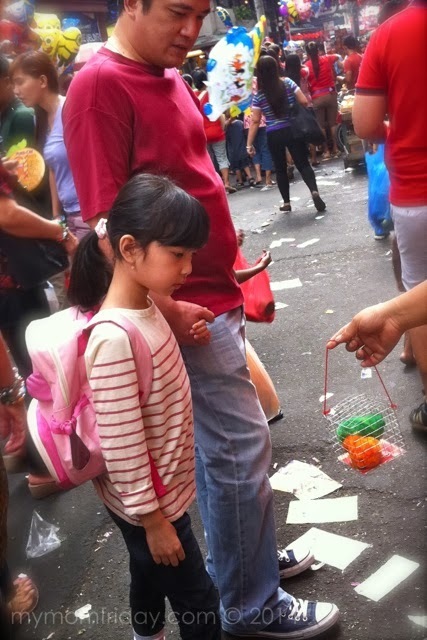 They've learned it was not easy to take care of them and opted to just enjoy looking at the rainbow-colored birds as we passed by the street. The chicks and quails were as colorful as the last time. 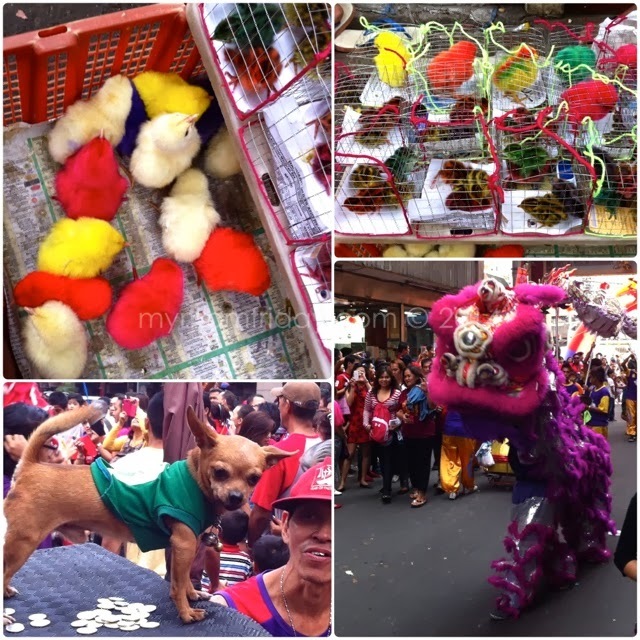 As we watched several lion and dragon dances, we also spotted a chihuahua making some noise on top of a tricycle! The climb for the ang pao / red envelope. The lions should find a way to get the prize from wherever the envelopes were hanged - like on a signage such as this, after dancing over firecrackers! 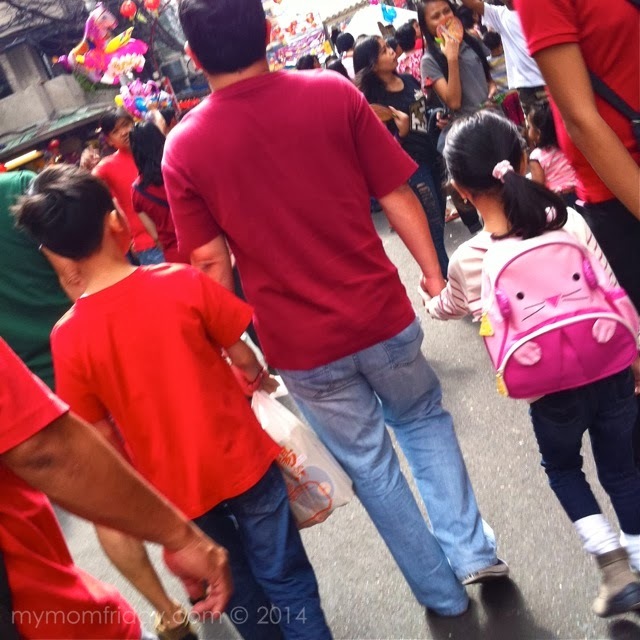 I was afraid for the guys under the costume walking around the firecrackers! We left Chinatown before 3pm. 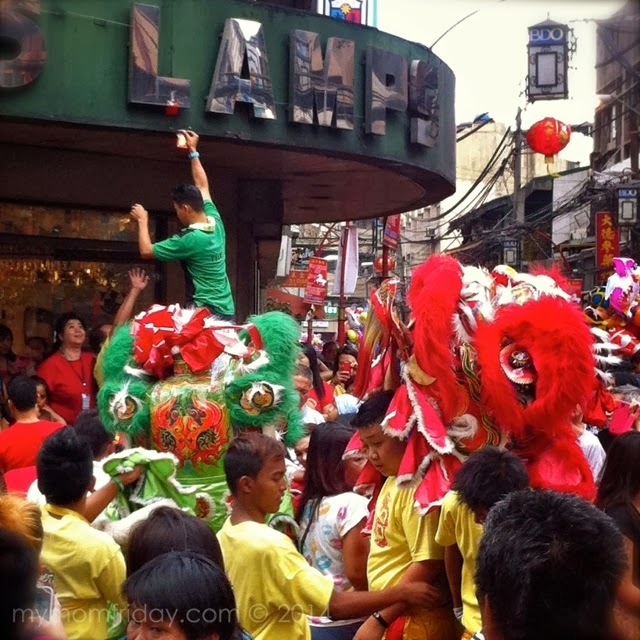 As we made our way out of Ongpin, towards Sta. 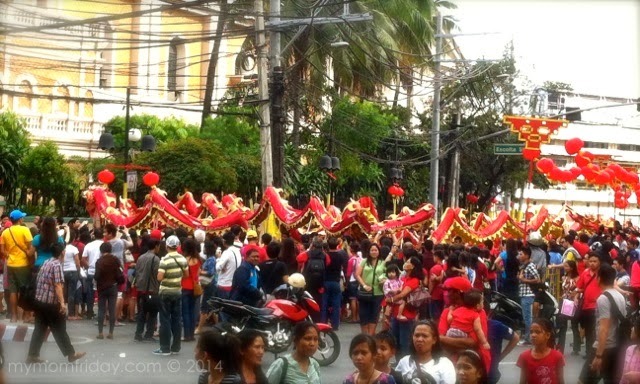 Cruz Church, the celebratory float of the Manila Mayor was about to enter. We got a glimpse of the VIPs on board. 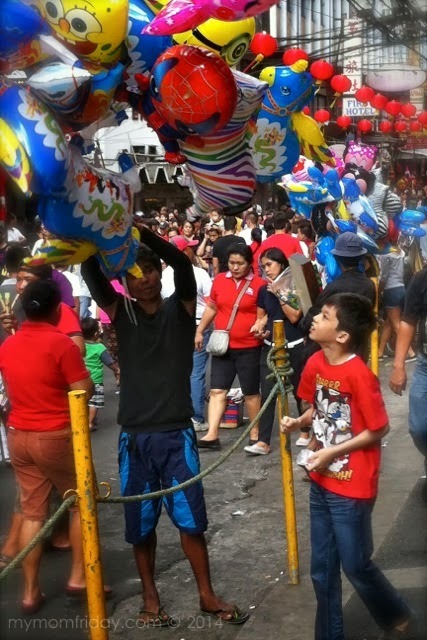 There were a lot of pushing as shoving as Mayor Joseph Estrada, Vice Mayor Isko Moreno, and the reigning Miss International threw out tokens to the crowd. Good thing we were able to leave before the float made its way through the main street, or else we'd be stuck. As we waited for our ride, right in front of Sta. Cruz Church was the longest dragon we've ever seen. I think they're part of another parade that afternoon. It was another amazing and super-charged day of celebration, especially for the Chinese community, as we welcome with hope and optimism the new year of the Wooden Horse. Gong Xi Fa Cai! 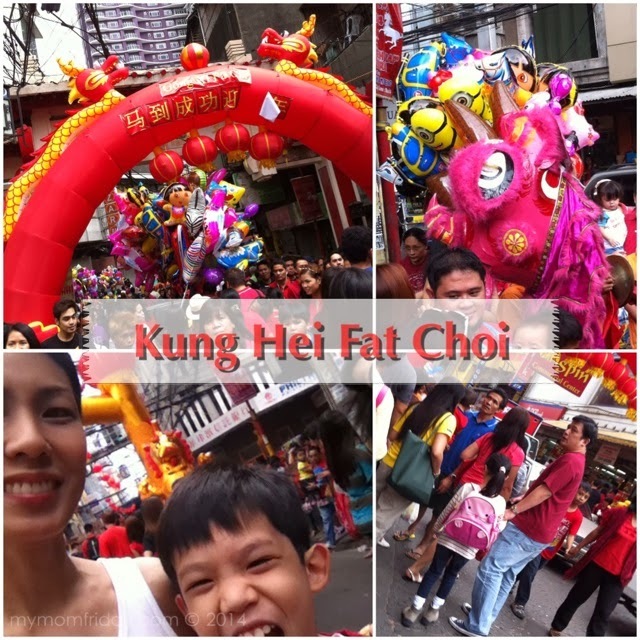 Kong Hei Fat Choi! Incidentally, J's Chinese birthday falls on Chinese new year, so it was also a celebration for his birthday. And today, February 3, is his birthday!